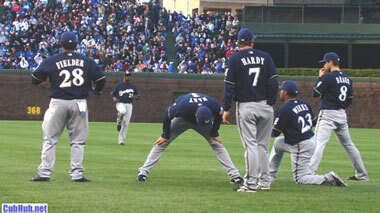 With a Brewers win and Mets loss today, the Brewers could clinch the Wild Card. Today’s game being irrelevant for the Cubs, and in my view having the Brewers win the Wild Card being favorable for the Cubs, it may be that both teams will celebrate a Brewers win at Miller Park. If the Brewers are the Wild Card, the Cubs would face the Western Division champion LA Dodgers in the NLDS. Of all the possible scenarios still on the table, I think I like this matchup best for the Cubs. Plus a buddy who is a die-hard Cubs fan just moved to LA and got tickets to NLDS Game 3 at Dodger Stadium. That could conceivably be the clincher if the Cubs sweep! Ok, I’m getting a head of myself here. I would rather see the Cubs face the Dodgers from a matchup perspective than either the Phillies or Mets. They can’t face the Brewers in round one because they are both in the same division. I think the Phillies would be the toughest opponent for the Cubs, followed by Mets, Dodgers and Brewers. Any way you slice it, this is an excellent conversation to have for Cub fans!